If you attended Constructing Modern Knowledge 2011, please publish your own blog recollections! 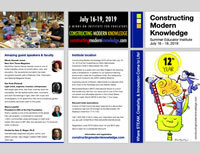 The 5th Anniversary Constructing Modern Knowledge 2012 will be held July 9-12, 2012 in Manchester, NH! Stay tuned for program and registration information.